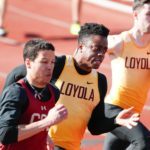 Despite a hamstring injury during his sophomore year, junior Leron Norton is a force for the Loyola track and field team. Sophomore Kevin White is looking to become the next Loyola runner to achieve a four-minute mile. He set a personal best 4:10.9 at the Black and Gold Premier in Iowa City, Iowa a week after running 4:14.12 at the John Tierney Classic in Milwaukee.